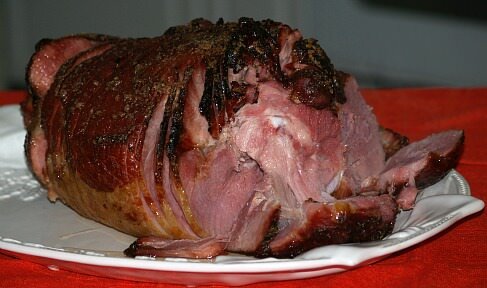 There is a great possibility that you will want to learn how to make ham leftovers if you are cooking a ham. Even if you only cook a half of ham, which is very common, you will still have a lot of meat. If you have only a few people for your dinner then it is likely there will be leftovers. Learn how to turn Ham leftovers into many casserole recipes. What was once a “clean out the refrigerator” event, casseroles are now planned. Most of the time I plan to have extra ingredients just for the purpose of making great casseroles. Many are made with canned soups and vegetables or packaged items which make them so convenient. They also can be made up ahead of time and placed in the refrigerator or freezer so they are convenient when you need an easy meal; just pop in the oven. Learn how to cook ham leftovers for breakfast browned in the skillet and served with fried eggs and toast. Ham and egg biscuits and ham and egg croissants are also quick and very good. By adding some chopped ham with scrambled eggs makes a delicious breakfast; or make scrambled egg omelet. A slice of ham on an English muffin topped with a poached egg and then topped with a creamy hollandaise sauce makes a wonderful eggs Benedict. For lunch a good chef’s salad always includes ham; a good use for ham leftovers. How about a crispy hot grilled ham and cheese sandwich. Have you ever had one with Gruyere cheese? How delicious! A simple slice of ham on a fresh slice of bread with a hat cup of tomato soup also makes a great lunch. There are many appetizer recipes that you can use ham leftovers in. Even if you normally use chicken, turkey or beef, try substituting the ham. Great recipes are developed just by trying. Casseroles are great for ham leftovers and this casserole has a lot of flavor. Mix all ingredients together until well blended. 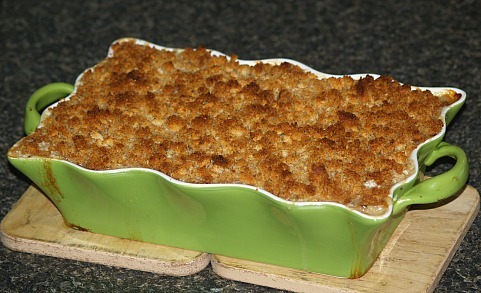 Dump into a greased 9x13 inch casserole baking dish. Bake for 30 minutes. Mix 2 cups cracker crumbs with ¼ cup melted butter and spread on top. Return to oven for another 30 minutes. Mix bread cubes, cheese and melted butter. Spread half of the mixture in a greased casserole baking dish. Top with peas. Cook and stir onion in the 3 tablespoons of butter until tender. Blend in the flour and seasonings. Stir in the milk and cook until smooth and creamy (only a couple of minutes). Stir in the meat and pour mixture over the peas in the casserole dish. Arrange tomato slices on top of mixture, then top with remaining bread mixture. Bake uncovered for 25 minutes. Melt butter in small saucepan; add mustard, Worcestershire sauce, poppy seeds and chopped onion. Heat and simmer for 5 minutes; spread on both halves of the rolls. Put ham and cheese on bottom halves of rolls in pan; top with other half. Cover with foil and heat for 30 minutes or until hot with oven temperature at 350F degrees. Fit 5 triangles into a nine inch pie plate pressing edges together to seal. 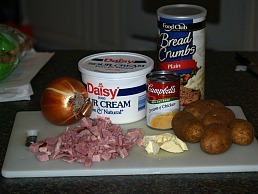 Combine chopped ham, Jack cheese, Parmesan cheese, onion and eggs; blend and spoon into pie plate. Cut remaining triangles into thin strips and arrange over mixture. Bake on lower rack of oven at 325F degrees for 1 hour; let stand 5 minutes before serving. Preheat oven to 350F degrees; lightly grease 9 X 13 inch baking pan. Slice onion thinly and separate into 8 medium size rings. Chop remaining onion and reserve 1/3 cup. NOTE: Any remaining onion can be stored in refrigerator by wrapping very tightly. Melt butter in a large skillet; add reserved ½ cup chopped onion and mushrooms. Sauté mixture until onion is tender crisp. In medium bowl combine eggs, milk and dry mustard; stir in mushroom mixture and set aside. Wrap ham slices around broccoli spears; slide onion ring over ham rollup. Insert 1 bell pepper in each end of ham rollup. Place roll ups down center of prepared pan with end of broccoli spears toward outside. Pour egg mixture around rollups; bake for 25 minute. Sprinkle cheese over roll ups; bake 10 to 15 minutes longer or until eggs are set and cheese melts.